As always, worthwhile plans take longer to put into action than you first think. 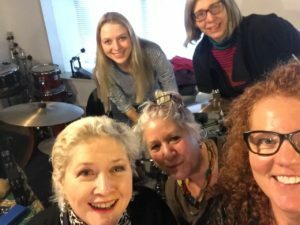 When I first thought about embarking on a project to write new compositions and collaborate with other women, it seemed like it would be a straightforward path. However, when you work with other people, have family responsibilities and have the challenges of different geographic locations (me in NE of Scotland, just about everyone else in London! ), you can’t ever make a fixed timeline work. You have to learn to be patient and flexible. Not really how you’d describe me. Haha. Sometimes, things seem to go so slowly that you think you’re never going to get there. I guess it just makes it all the more worthwhile when you do, right? 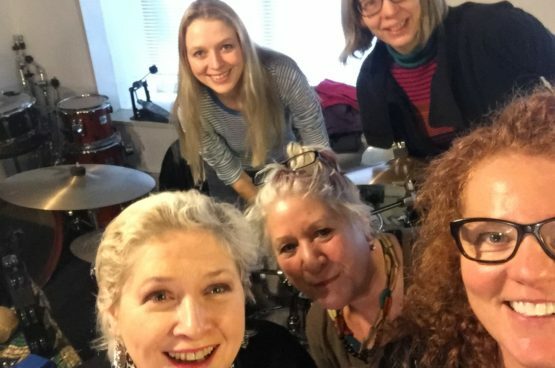 So, after months of writing and collaborating with Janette Mason, the songs are now written and we’ve also spent time with some fab musicians working through the material, refining and developing them even more. It was such a delight to work with a group of accomplished, generous, enthusiastic and communicative women. I can’t express just how special it was to spend time with them! Between them, they brought years of experience and lots of ideas. The ideal people to collaborate with. So thank you Janette Mason, Julie Walkington, Sophie Alloway and Josefina Cupido. Having fun making some new sounds. Now the work is on to bring it to an audience. So watch out!